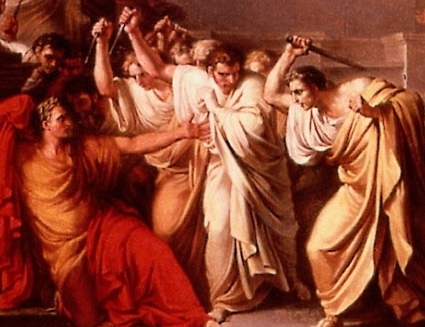 Beware the ides of March! Enjoy these trailers instead, Caesar, much safer. So, Oscars and their varied thrills and disappointments are behind us, and now we’re in that quiet period when nothing earth-shattering or awards contending appears, but nor does anything that might have too many famous names and giant explosions. And no, I’m not counting Battle: Los Angeles, which might have Aaron Echkart and giant space aliens, but wasn’t produced with the same level of studio-crushing budget that an Independence Day or an Armageddon was. Blockbuster season starts at the beginning of May, this year with Thor, and the odds of getting an awards contender this early are pretty small. Having said that, we can still get quality films; it’s a time for everyone to breathe and relax, and for viewers to pick up tickets for something more unassuming. Or Battle: Los Angeles, it’s your call. After Skyline made November’s list, I’ve chosen not to put B:LA in this month’s list, mainly because it just looks like a more expensive version, and in the end I didn’t see Skyline. There are a number of other interesting looking films with average and indistinguishable looking trailers this month, including The Adjustment Bureau (the third Matt Damon movie of the year, he’s a busy boy that one), Ken Loach’s latest Route Irish and the Bradley Cooper / Robert De Niro high concept thriller Limitless. But here’s the six that stood out from the crowd for me this month. What’s better than one road movie? Two road movies in one, that’s what! But pitch to me, make it different. Maybe make it about the journeys of two more mature ladies, rather than strapping young men. I know – let’s have one half in Wales and the other half in Argentina! Genius. Showing this week in Wales. And one cinema in London. And none in Argentina. Oh well. Johnny Depp and Gore Verbinski. Not yet a partership of Depp / Burton lengths or heights, but another team up here. Verbinski has abandoned the Pirates franchise to the open seas and instead this team up is the first animated movie from special effects wizards Industrial Light and Magic. Consequently it has an instant visual appeal; time will tell if Depp and Verbinski’s talents have worked on things like plot and character. It’s a new Hammer horror! With Christopher Lee in it! But this is no ordinary Hammer horror, mainly because the rest of it feels like a bog standard American horror that the likes of Hilary Swank normally do to give their career variety. Oh wait, there’s Hilary Swank now. Can’t wait to see how the culture clash pans out on this one, and well done to Sir Chris for keeping going as his age. I hope I have half that energy, at half that age for that matter. Richard Ayoade will be a familiar face to any fans of The IT Crowd, The Mighty Boosh and the works of Garth Marenghi, but he’s also an acclaimed music video director, having worked on videos for the likes of Arctic Monkeys, Kasabian and Vampire Weekend. He’s assembled a cracking cast for his first feature, and if I had a trailer of the month then this would probably be it. I don’t, but let’s let this one have the glory this month anyway. Now a window into international distribution. This was a Sundance winner… in 2008. It appeared on many critics’ ten best lists that year, and picked up prizes at the Independent Spirit Awards in 2009. But, thanks to those vagaries of distribution, it’s only now making its way into our cinemas. Long shots in the trailer and a feeling of urgency help this one to grab your attention in three minutes or under. It’s a movie about cave paintings. Directed by Werner Herzog. In 3D. If you’re not at least curious now, you’re reading the wrong blog. This entry was posted in Evangelism and tagged Ballast, Cave Of Forgotten Dreams, Patagonia, Rango, Submarine, The Resident.